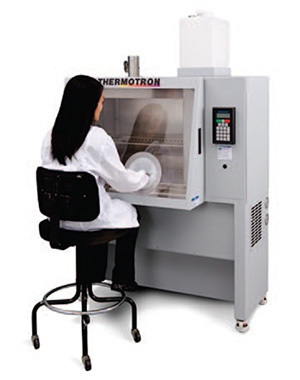 Thermotron developed Cytogenetic Slide drying tests chamber, CDS-5 in collaboration with Mayo Clinic, USA. CDS-5 is designed specifically for conducting Cytogenetic slide drying tests during harvest of in situ and non-in situ grown cultures. The Thermotron CDS-5 provides the optimum controlled temperature and humidity environment for achieving ideal chromosome spreading results. The use of an environmentally controlled drying chamber is a practical and cost effective way of achieving ideal chromosome spreading in a routine and highly consistent manner. Favorable chromosome spreading results can be obtained for both in situ and non-in situ cultures including PHA stimulated lymphocytes, bone marrow, amniocytes and fibroblast.